A new, so far unique website has been launched, offering drivers impartial advice, news and tips about wheel alignment. 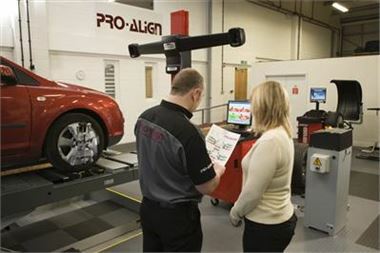 AlignMyCar.co.uk is also driving home the message of the importance and extra benefits that wheel alignment can offer, including better fuel mileage, reduced tyre wear, safer driving and improved handling. Visitors to the new site will find a host of useful sections provided by industry experts, including what customers should expect when having their wheels aligned, so they know to ask the right questions in order to receive the highest possible levels of service and that their cars are restored to the vehicle manufacturer's original settings for optimum performance, comfort and safety. Listed on the site are the details of workshops across the UK that are equipped with specialist state-of-the-art, Hunter wheel alignment equipment. Users can use the site's search facility to find their nearest centre and print off a discount voucher entitling them to a 5% reduction on their alignment bill at participating outlets. Kathryn Beaurain from AlignMyCar, said: "The new website provides a one-stop-shop for any motorist looking to understand more about alignment or just wanting to get their wheels properly aligned. It's been designed to dispel the myths and unscramble the industry jargon related to this important vehicle service and is brimming with useful information that should 'point' any visitor in the right direction." Modern wheel alignment systems now use sophisticated technology to measure 14 primary angles of all four wheels in a matter of minutes. Not only can this specialist service help reduce drivers' running costs, but it can also make for safer driving and better handling as any vehicle pull can be identified, and steering wheels set straight, to avoid further driving distractions. "Motorists can reduce their running costs by ensuring all wheels are aligned. If all the tyres point in the right direction then there will be less 'scrubbing' action on the road surface and subsequently reduced tyre wear, as well as reduced rolling resistance, which will all go to help saving on their fuel costs," adds Kathryn. The launch of the website comes just weeks after the Labour Party revealed that repairs to potholes left by their policies (a major cause of misalignment) could cost up to £13bn and Lambeth Council issued new guidelines stating the potholes less than 40mm deep will no longer be filled in. "With the combination of rising tyre prices and pothole ridden roads, the need for drivers to protect their tyre investment and car with a professional wheel alignment service has never been greater," concludes Kathryn. UK manufacturers has gotten it to the next level, Pro- align advance systems would be soon the asset of car manufacturing. There are vast ranges of tyres which they could accompany.